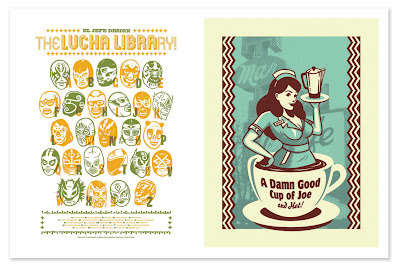 The LUCHA LIBRAry will be hung in Naomi's room so she can learn her alphabet properly. The Twin Peaks inspired A Damn Good Cup of Joe... And Hot! will, of course, hang in the kitchen. UPDATE: These posters are WAY cooler in person - the color is awesome and the prints are near perfect. AND Jeff shipped FedEx... we feel so taken care of.